When it comes to baking, sugar is one of the most important ingredients we use. 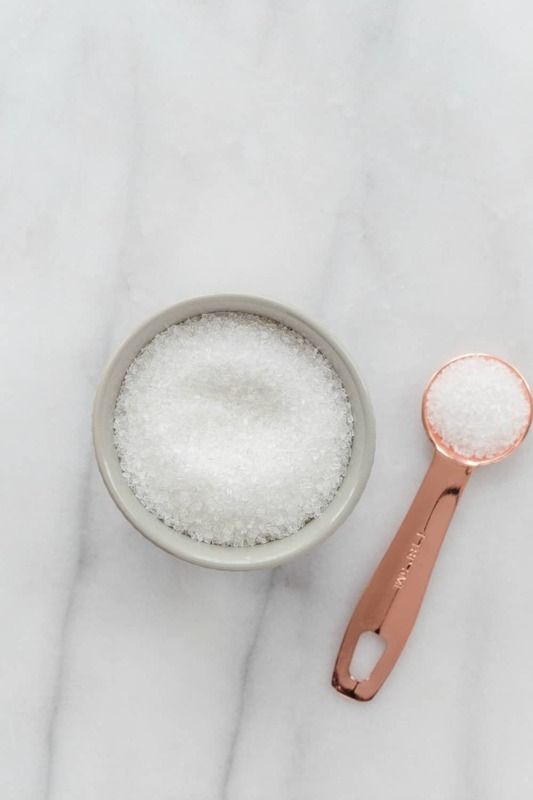 But do you really know the difference between all of the types of sugar? Sugar is an integral part of the baking that we do day to day. Of course, the sweetness it provides to things like cookies and cakes is obvious. In breads and rolls, however, it feeds the yeast that makes for a beautiful rise. For most people, the first thing that comes to mind when hearing the word sugar is white, granulated sugar. It’s the type that America uses most often for baking and sweetening our morning cup of coffee. However, the more often you bake, the more different types of sugar you may come across. In an effort to expand my own baking horizons, I thought we should discuss the types of sugar that are available for all of our baking needs. Are you ready to talk sugar? Granulated sugar is also sometimes known as white sugar, or “regular” sugar. Granulated sugar has had all of the naturally present molasses refined out of it. It is the sugar that is most commonly used in baking. 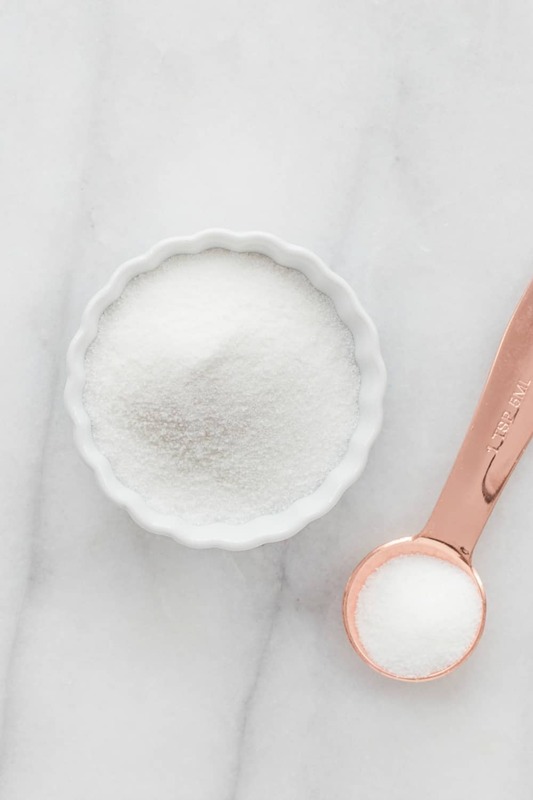 The fine crystals in granulated sugar don’t cake together, which makes it perfect for measuring, sprinkling onto food and dissolving into drinks. 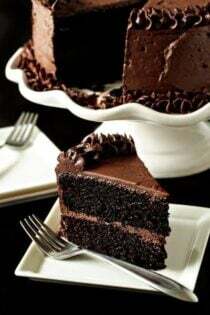 Granulated sugar is what I use in most of my recipes, including The Best Chocolate Cake recipe. 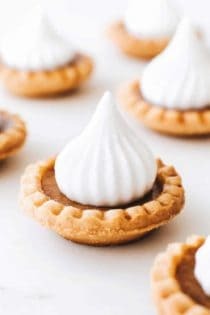 New bakers often get confused when they see the words “powdered sugar” and “confectioners’ sugar” used interchangeably. But this is because confectioners’ sugar and powdered sugar are the same thing! 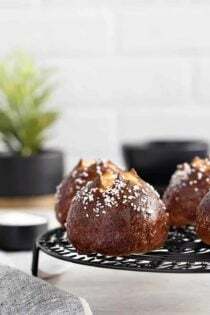 Powdered or confectioners’ sugar is granulated sugar that has been finely ground and mixed with a small amount of cornstarch to prevent caking. 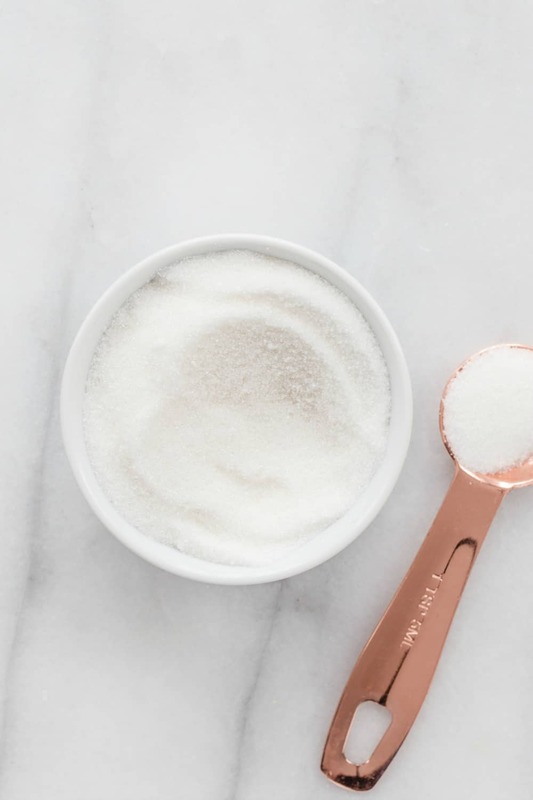 This is the sugar we commonly use for frostings, glazes, and that snowy covering on doughnuts that no doubt is all over your face and hands with the first bite. 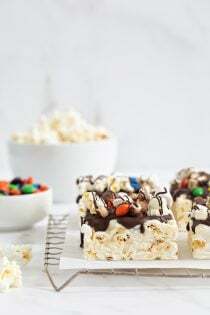 Puppy Chow is a recipe that famously uses confectioners’ sugar for that beautiful white coating. Icing sugar is simply another name for powdered sugar or confectioners’ sugar. 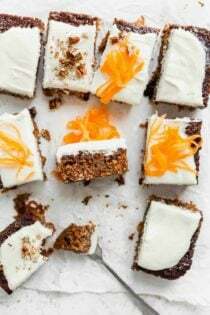 While it is a less common name here in the U.S., it makes sense since icing, powdered or confectioners’ sugar is so perfect for making icings, frostings and fillings, such as the filling in my Homemade Oatmeal Cream Pie recipe. As you can tell from its name, coarse sugar has much larger crystals than regular white sugar. The larger size of the crystals (about the size of pretzel salt) makes the sugar stronger and more resistant to heat. This type of sugar also helps to give baked goods or candy a little texture. 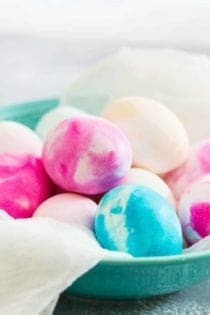 Coarse sugar is used mainly for decorating and comes in a rainbow of colors. Because of this, it is sometimes called decorating sugar. I like topping my Cherry Hand Pies recipe with coarse sugar for a little texture and added sweetness. Sanding sugar is another large-crystal sugar. It is between white granulated and coarse sugar in size. Sanding sugar is another decorating sugar and comes in many colors. It also reflects light and gives of a sparkly shine. And, who doesn’t love their baked goods sparkly? Sanding sugar is a great addition to any DIY Cookie Decorating Station. Brown sugar is white sugar that has had cane molasses added to it. Brown sugar can harden if left open to the air, so it is best stored in an airtight container. If your brown sugar has hardened, you can microwave it for a few seconds, or place a piece of bread in the bag and leave it for a day. 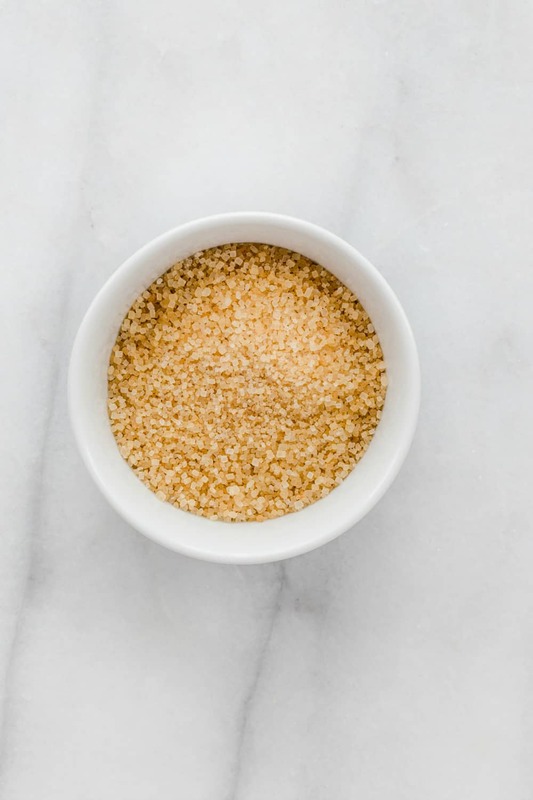 When you go to the store, you’ll see two types of brown sugar: light brown sugar and dark brown sugar. These names – light or dark – refer to the amount of molasses that is present in the sugar. Light brown sugar is what is used more often in baking, sauces and, glazes. I prefer light brown sugar in my favorite Peanut Butter Blossoms recipe. Dark brown sugar, because of the rich molasses flavor, is used in richer foods, like gingerbread. Try dark brown sugar in Savory Sweet Life’s Chocolate Chip Cookies. Make sure everything is incorporated thoroughly in a food processor, and you can store it for up to a month! Superfine sugar is also sometimes called ultrafine sugar, bar sugar or caster sugar. 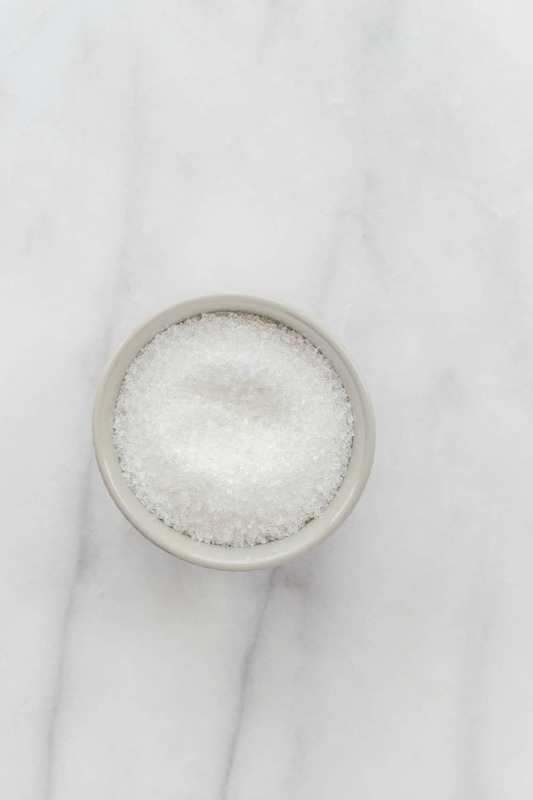 These sugars have the smallest crystal size of white granulated sugar. Superfine sugar is generally used in making delicate or smooth desserts such as mousse, meringues or puddings. 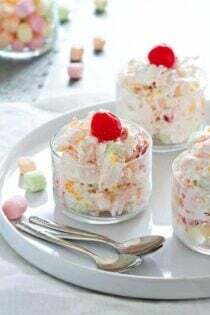 It also is great for sweetening cold beverages because it doesn’t need heat to dissolve. Turbinado sugar is raw sugar that has only had the surface molasses washed off. It is light in color, usually has a large crystal, and is slightly lower in calories than white sugar due to the moisture content. Turbinado sugar is mainly used in sweetening beverages, but can also be used in baking. Muscovado sugar, also known as Barbados sugar, is a type of British brown sugar. Muscovado sugar is very dark brown in color and has more molasses than light or dark brown sugar. The sugar crystals are a little larger than regular brown sugar and the texture is stickier. 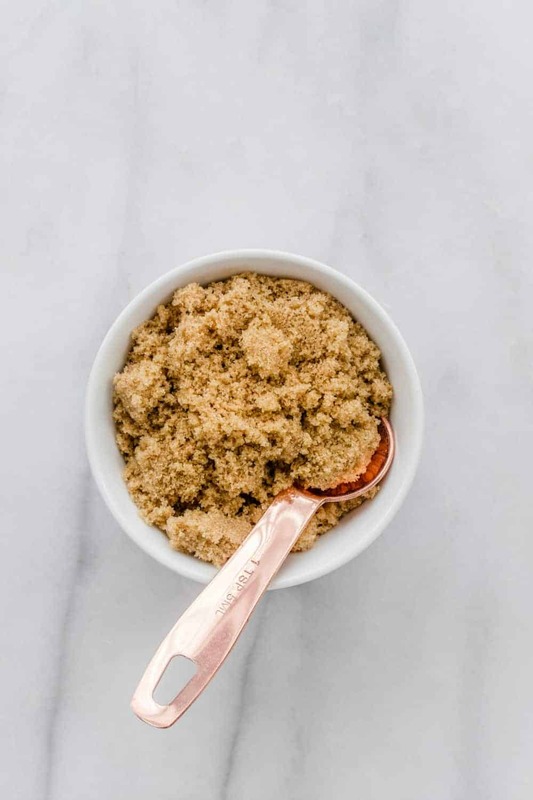 Muscovado sugar is used in sweets with rich flavors such as gingerbread, coffee cake, and fudge. Demerara sugar is another type of sugar that is very popular in England. In the U.S., the most comparable sugar is turbinado sugar – because they are both “raw”. 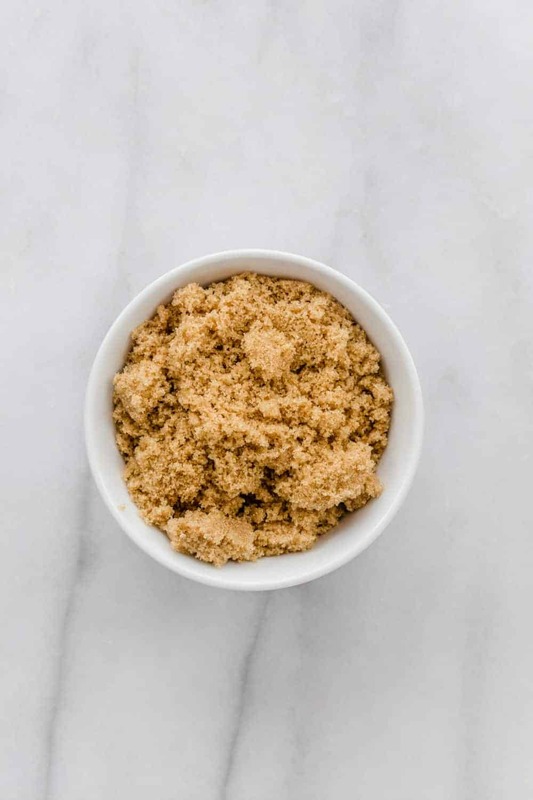 Demerara sugar is a large-grained, crunchy sugar that hasn’t had all of the molasses refined out. Demerara sugar is great in tea, coffee, dissolved into hot cereals or sprinkled onto baked goods. 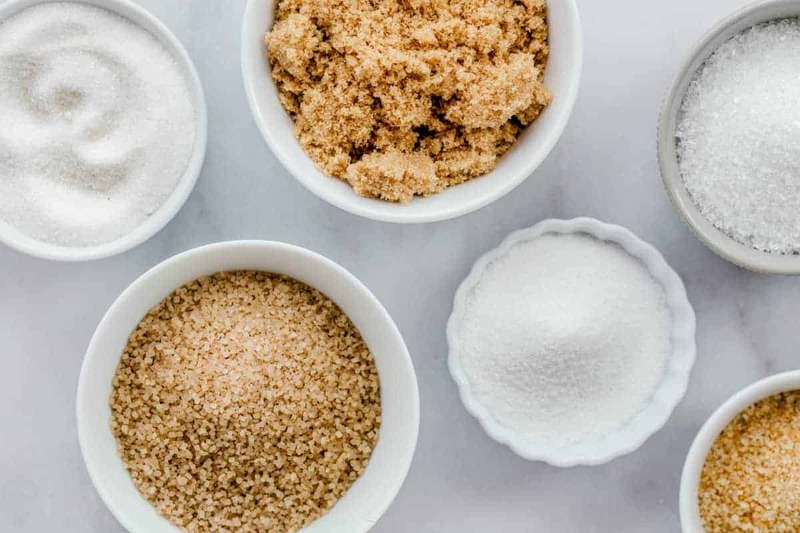 While you might feel like you just took a class on the types of sugar, who couldn’t use a little extra knowledge about such an important ingredient? 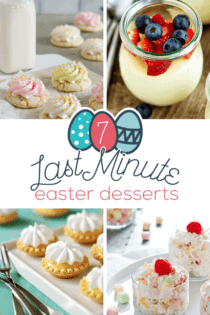 Now it’s time to make sure you are stocked up and ready to bake! I love using different types of sugar – demerara/turbinado is my absolute favourite but I love seeing how different sugars create different flavours and textures. Thanks for the run down on the sugars. I had no idea about the brown sugar and that I can make it at home! This is a great side by side sugar reference that will be helpful to everyone. Thanks so much! Very informative! Thanks! I like the tips of how to soften brown sugar once it’s hardened. I find myself reaching for my muscovado sugar more and more — gives you a lot of brown sugar richness without tasting too molasses-y or requiring so much actual sugar. I’m trying to retrain my husband’s and my sweet tooth, and muscovado is one of my main crutches! Such an informative post! I use all different types of sugars but I never really understood the differences (other than the color and texture of course) until now! Thank you for posting this! It was an interesting read! Thanks for the informative post I didn’t realise I could make my own brown sugar. I’ll file that away in case I run out one day because we always have molasses in, I love the stuff. What a lovely post – I may even be reading this for the second time but in all a lovely read! and a blender. Works great. Great article on Sugar but I wish there had been info on the difference between ca e and beet sugars and when to use or not use them. I’m interested in the ‘new wave’ kinds of sugar available–like stevia, agave, succanat, sucralose (etc) blends. Any info? Thanks! hello thank you for this great info about sugar..
You’re so welcome! Have a lovely day and thank you for following MBA! Hi John – it’s best to discuss with your doctor what sugar substitutes to use in recipes. I am a prep cook and the kitchen I work in uses cane sugar is that different than granulated sugar? If so do you measure it differently in baking? As far as I know, most “granulated” sugars – cane, Muscovado, white – can all be interchanged and measured the same, cup for cup. 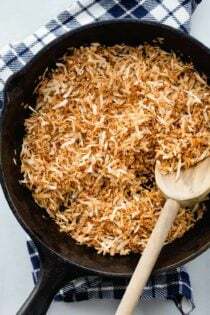 It’s when the texture changes, like powdered, castor, or brown sugar made with molasses, that you can’t interchange them as easily. Wow, I never knew that there was such an abundance of different types of sugar. With this information I can now completely expand my baking ability and my pallet to a whole new arrangement of flavors. 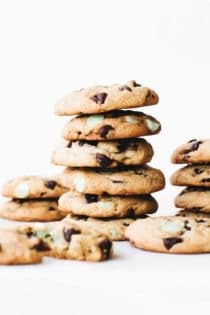 Sugar truly is the building blocks of all baking recipes and I am glad there is someone out there with such a passion and knowledge for it as yourself. I will be reading and blogging quite more often on these posts as you have peaked my interest and curiosity on the subject. I am sure you will bring forth a whole new world for me. 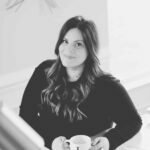 First of all, I just found your blog and think it’s great!. As a professional, I loved the quick, understandable information on the different types of sugars. I noticed you mentioned home made brown sugar but you can also make superfine and powdered. Superfine, or baker’s sugar can be made by putting it in a food processor and processing to make smaller crystals. Powdered sugar can be made by putting sugar in a blender and blending it to break it down further. Be prepared for a cloud of sugar to rush out when you take the cover off the blender. In either case, do a cup or two at a time for best results. I am in the processor gather information on new blogs I have found and loved. Your’s will be in that list. I’ll let you know when it goes up. Thank you for posting about sugar…even though I am here a year later — still my problem keeps popping up. Why is it that my Royal icing…which nearly every sugar cookie recipe calls for as a frosting… always tastes like chalk, no matter which confectioner’s sugar I use or what flavoring I try to add? 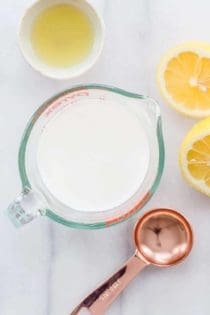 Generally, I am using meringue powder and confectioner’s sugar with either vanilla or lemon juice, but I have tried other flavoring ingredients with the same disastrous results. Hi, Julie! Not everyone enjoys the taste of royal icing. 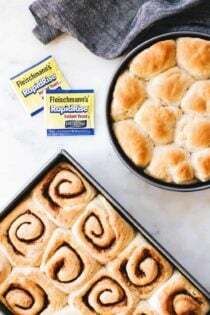 If you Google “alternatives to royal icing,” you’ll find a lot of different recipes that you might like better. Good luck! Hi, Carrie! I’m not sure what your question is. Can you give me a little more information? I’m happy to help as best as I can! You’re welcome, Summer! I happen to love coarse sugar on top of pies! Thank you for writing this! I’ve been wondering what the differences between all these sugars were. Trying out new recipes I could not for the life of me figure out the difference between icing, powdered and confectioner’s sugars. Turns out they’re all the same, ha! I’m glad this helps, Jackie! How do I post this to Pinterest ? And may I? Thank you. Hi, Starthys! You can save anything on my site to Pinterest! Here’s the pin for the Fundamentals: Types of Sugar. I hope this helps! Hi Jamie, I know this may sound weird, but what is your last name? I am doing a science experiment involving changing the types of sugars in a recipe (I’m in 10th grade), and I’m referring to this article in my research paper, and in order to cite it properly I need your last name. If you’re uncomfortable releasing this information, I understand and can easily use a different website. Thank you! Not a weird question at all, Katie! My last name is Lothridge. Your science experiment sounds fascinating. Good luck! Hi, Kathleen! I feel the texture is better with the powdered sugar. Let me know if I can help with anything else! where can you get these types of sugars? You can many of them in grocery stores and online. Have a great day. 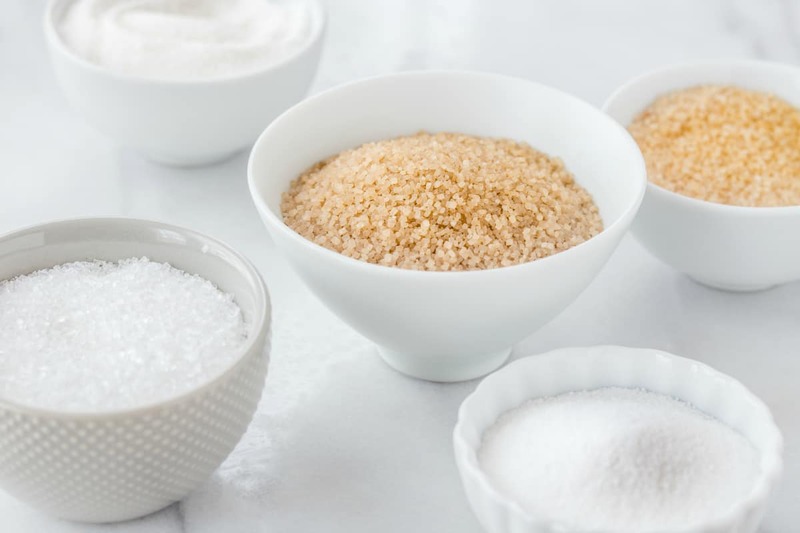 Is refined and granulated sugar the same ? Will there be a difference in texture when baking? Hi Nora – Refined sugar just refers to sugar that has been processed, usually from sugar cane. 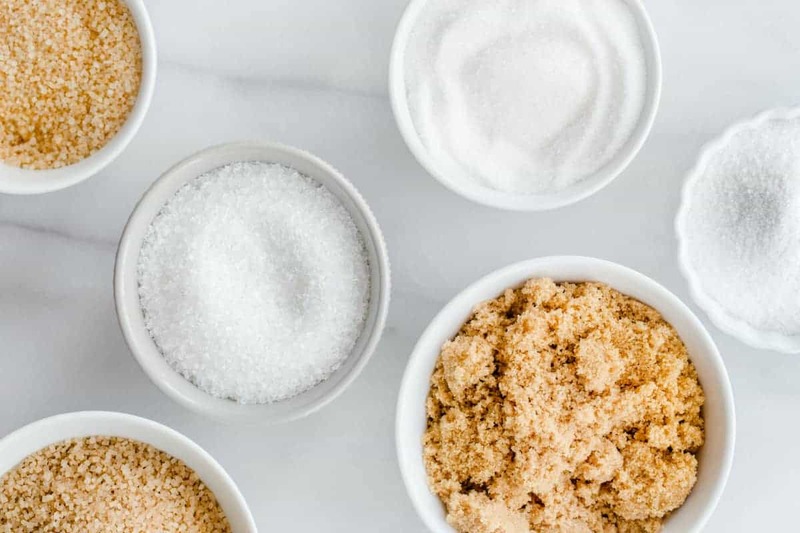 Granulated sugar is a type of refined sugar, but refined sugar can also describe the other sugars in this post. Hope this helps! Happy baking. Can you help me? I recently noticed a change in commercial brown sugar. Both light and dark versions were always slightly moist, they had to be scooped rather than poured, and they could be compacted. Recipes in fact, would say the brown sugar should be packed when measurin. The only products I can find now on store shelves or online are granulated. They pour. They do not compact. 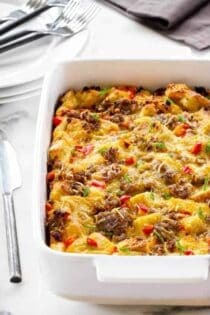 I’ve tried the food processor method but still do not get the results I remember from years ago. I am convinced there is something different in the newer brown sugars and I they don’t give the same luscious, gooey quality to cinnamon rolls or cinnamon toast. What happened in the industry? 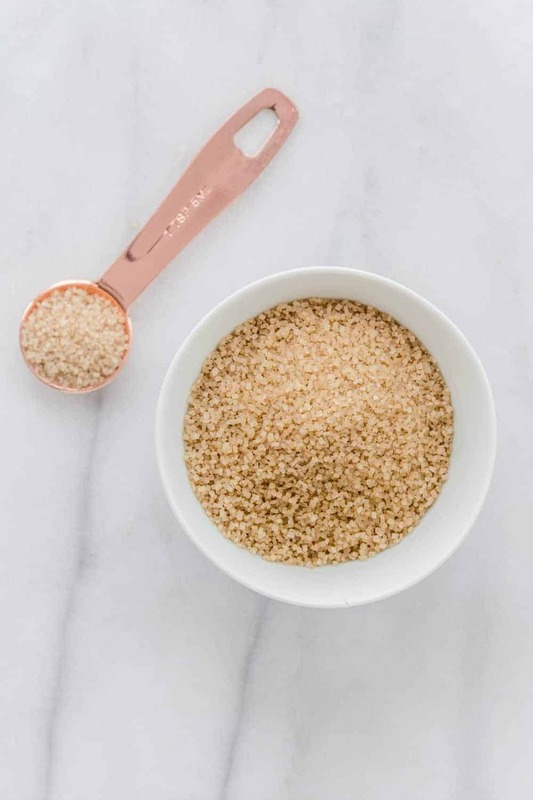 Hi Betty – I’ve definitely noticed this issue when I purchase organic brown sugar; it definitely is more granulated than conventional brown sugar. The regular brown sugar I buy (usually Domino brand) is still moist and easily compacted, so I’m not sure. Maybe someone else here will have some insight. Thanks for taking the time to comment! Happy baking. This was really helpful in baking. Explained things clearly. Thanks so much for stopping by, Maman! I appreciate you taking the time to comment. Happy Baking! Really helpful. I never knew there were so many types of sugars. Thanks so much for stopping by, Lucie! I appreciate you taking the time to comment. Happy Baking! 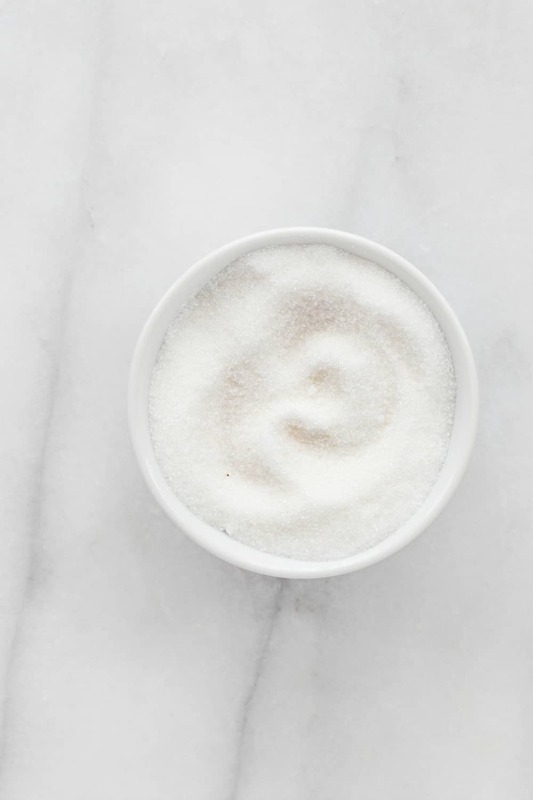 Is superfine sugar more sweet than regular granulated sugar? I’m thinking if you took a cup of regular granulated sugar and processed it in a food processor to a finer size, if you measured the sugar again, it would be less than a cup. I think you would need to add more superfine sugar to make the full cup. For this reason, I think it would be sweeter. If a recipe calls for superfine sugar, then the sweetness level is taken into account but if you had a recipe that called for regular granulated sugar and you only had superfine sugar on hand, then I would think you would need to use a little less to achieve the same sweetness level that the recipe called for. Is this correct? Hi Paula – I have never substituted superfine sugar for granulated sugar so I am not sure of the result. I think you would need to be careful with the texture of the sugar as well, as that can also affect how baked goods turn out. Happy baking! Considering that ANY “sugar” is toxic to Diabetics (both my parents are / were hyperglycemic – my mother passsed in 2002 as my father also now faces repeating insulin injections) I am VERY CAUTIOUS watching all sugars / sweets I eat. How / if-differently can or should I use Liquid-forms of Sweeteners (molassas and “engineered (brands) of sugar) to improve my foods? Hello! 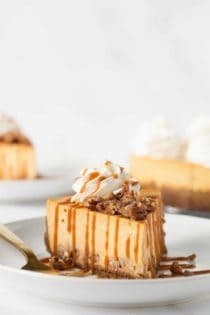 I unfortunately am not an expert in using sugar substitutes, aside from occasionally using them in recipes such as my low-carb cheesecake. I’m sorry I can’t be of more help on this! To keep my brown sugar from becoming hard I place 3 or 4 large marshmallows in jar or airtight container and it stays soft. I tried mini marshmallows but they didn’t work for long as they seem to lose their moisture quite rapidly. Thanks so much for stopping by, Nancy! That’s a great tip. I appreciate you taking the time to comment. Happy Baking! Thank you! Thank you! So helpful! Thanks so much for stopping by, Theresa! I appreciate you taking the time to comment. Happy Baking! One of the hardest things I had to do when I moved to the Netherlands was to adapt my baking to their sugar! The brown sugar is more moist and coarser and the white sugar is very large! Now that I’ve gotten used to it, we’re moving back to the States. I am looking forward to reacquainting myself to American products, however. Especially to buying powdered sugar in containers bigger than 250 grams and to buying more than 2 pounds of flour at a time! Thanks for the great article! Thanks so much for stopping by, Patt! I bet that was a challenge. I appreciate you taking the time to comment. Happy Baking! How interesting! I love using Turbinado sugar for my coffee. I never even heard of Demerara but I guess that makes sense as you say it is most popular in the UK. Thanks so much for stopping by, Scarlet! I appreciate you taking the time to comment. Happy Baking! I am have had issue with all brands of granulated sugar remaining sugar in anything I make. Has there been a change in processing. Frostings are especially a problem. I never had this problem until the last few years. I just made from scratch carmel frosting and ended up thowing it out… it was nothing but crystalyzed sugar. Now I have to go and buy my grandson some decent ones. I have made carmel frosting many times but it has never been the same the last few years. Hi Susan! I haven’t experienced the issue you’re describing. Hopefully another reader might have some idea and might be able to help! Thanks so much for stopping by, Alejandra! I appreciate you taking the time to comment. Happy Baking! Interesting read. Thank you. Even as a baker I learnt a few things here!